Male elephants in the wild. A pack of wild male elephants and an inadequately designed form get the credit for inspiring the dissertation study done by School of Public Health alumnus Scott Patlovich, Dr.P.H., a former Southwest Center for Occupational and Environmental Health (SWCOEH) Center trainee in industrial hygiene. The study recently made the cover of the April issue of Applied Biosafety, the peer-reviewed professional journal of the American Biological Safety Association. 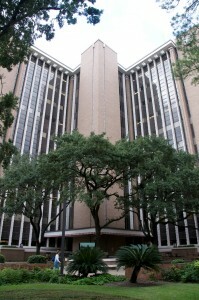 Patlovich, now director of Environmental Health and Safety for The University of Texas Health Science Center at Houston (UTHealth), encountered the risk assessment form in question as a safety manager for the National University of Singapore. He was reviewing a research project involving infectious disease agents being collected in the field. “This form is terrible,” wrote the investigator. Patlovich could only agree. It focused on safe work practices, containment equipment, and biosafety level designations specific to laboratories—and was adequate for that purpose. However, it had no place to list safety risks in the field, especially not the wild elephants the investigator thought his research team might encounter. Scott Patlovich’s doctoral dissertation article was featured on the cover of Applied Biosafety, the peer-reviewed professional journal of the American Biological Safety Association. Used with permission. Depending on the geographic location, field research exposes investigators to hazards not typically encountered in the lab, such as disease-carrying insects, wild animals, and extremes in temperature and altitude. Field researchers may also face danger during travel to and from remote locations, and from political and social unrest. And, as we’ve learned with the most recent Ebola outbreak that infected many health care workers, working with infectious disease in the field can be perilous without proper personal protective equipment and exacting safety protocols. Patlovich kept field safety in mind when he returned to Houston to complete his doctorate in Environmental and Occupational Health Sciences at the School of Public Health, ultimately choosing the subject as the focus of his dissertation project with the backing of advisor, Robert Emery, Dr.P.H., professor of occupational health and UTHealth vice president for safety, health, environment and risk management. How safe is field research? With his study, Patlovich aimed to assess how biological safety programs consider and evaluate the risks associated with field collection activities. He surveyed a cross section of more than 1,400 biosafety professionals with the American Biological Safety Association to get a better feel for how they approached field research safety. What kinds of techniques did they use in the field to promote safety? Did they feel they were properly trained to recommend appropriate controls in the field? Did they have adequate resources or documents to guide them? As expected, Patlovich found that risk assessment forms were not always appropriate for field research and that while many institutions conduct field research, only some of them had a safety committee charged to review field research protocols. Many biosafety professionals reported that they don’t typically receive formal training on field research issues, but were open to the idea of additional training. When asked about whom they would include in their ideal field research oversight program, the majority ranked a knowledgeable veterinarian and occupational health physician at the top of their lists. Currently, some research oversight committees don’t include experts in these disciplines to oversee field research. The results provided an eye-opening look at the current state of field research safety, and areas that need tweaking. Patlovich says he hopes to partner with ABSA to develop a field-safety curriculum, available through the association to practicing biosafety professionals. He also suggests developing a resource-to-catalog field research infections so that lessons learned from these events could be shared broadly and creating specific risk assessment forms for field research.